Description of "A Thorny Ride"
This is a story of a girl who was sexually assaulted and brutalized by a couple of rich, spoiled brats. This separated her from her blooming love. She had to face many hardships and she went through a life bugging trauma which changed her entire life. She bravely brought those criminals to the books and got them punished. It was not at all easy. It was a hard ride, which would not have been possible without a good friend, who stood by her side all the way till the end. Her red carpet luxury life turned in to 'A THORNY RIDE'. This is a story of her love, hatred, revenge, and success. 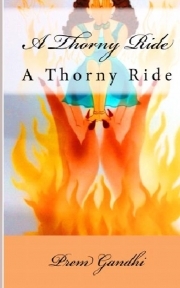 Reviews of "A Thorny Ride"
It is one of the hear tearing story. Sexual assaults are so sudden that it takes whole of life time to come our of the shock, where as the rapists finish their ordeals in few years and start a new life. Many times the person who tries to help the victim of sexual assault is beleaguered and the way things take a tune creates irresponsible situation. The police and the society look at these victims like a criminals. And due to this fact the sexual assaults are least reported crimes. These victims go through trauma through out their lives.Even if one person come forward to offer a helping hand to these victims they can surely have a better life. This is a excellent story narrated in simple words. Suitable for any ages and each and every person must read. Even if one percent readers change their attitude treatment to these victims, surely there would be great change in the society and victims of sexual assault would have a better life. in the Garden City of India, Bangalore. Presently, lives in Thane, Mumbai, and takes tuitions. “A Thorny Ride” is a fiction, it is a story of a grown up girl who comes to India, with her parents from Thailand. Her father is relocated to Mumbai who got a job as a fashion designer in Mumbai. It is difficult for the family to migrate since they are well set in Thailand. In Mumbai, children are admitted in one of the pinnacle schools. The girl, Rachel who is nearly seventeen years old is happy to go person and finds her new school amazing. Here she gets acquainted with a student who is a son of a rich and a famous personality. This is the story which narrates about their growing friendship turning in to a blooming love for nearly two years. In one of the parties which were arranged by her boy friend Rachel was sexually assaulted by two unknown persons. She was attacked and brutalized. She was left unconscious in the cold to suffer. She was bleeding profusely. She was in a terrible shock and had to face a trauma of her lifetime. This is the story which narrates her trauma and her sufferings. She lost her love and suffered mentally. Even at police station it was not easy to prove an attack. During her ordeal, she was helped by her good friend. He helped her to bring those assailants to the books and punish them. This is a story, where her revenge turns in to a passion and makes those morons to pay for their ghastly crime. This is the story of her atrocities and revenge. At last she finds her true love, which is not rich and young, but for her he is the bravest man she has ever met. This novel narrates how one good friend can turn a tide. This is the story of finding her true love and reaching to great heights. This is the story of what good friends can do to help a friend in distress…..